Everyone seems to have their view of vampires. That much is true but what if twilight&apos;s happy ending took a turn for the worse. What if the book had a different effect on us? What if it made us hate vampires? Why does love prevail? Well? Does it always? This story will point out the views of others who wouldn&apos;t fancy a vampire. But will the main character make peace instead of war? Vote, comment, become a fan!!! It seemed like a good idea at first but I realized this wasn&apos;t such a good idea. If it hadn&apos;t been for the money I would never have done this. So what am I doing you might ask? Well right now I&apos;m walking alone in the deserted woods in the middle of the night, trying to think of the positives. None were coming to me. Fog was spiraling its way across the frost ridden ground and the moonlight made it as clear as day. How did I end up here, right now? Well it all started when I was born into a very highly praised family of vampire hunters. Of course this meant my family was hated by all vampires everywhere. So I, being the only daughter of the vampire hunter&apos;s family was kidnapped at a very young age. 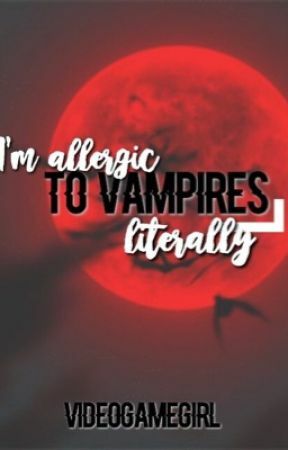 But I was special....I am allergic to vampires. Technically their allergic to me but if they touch me it feels like I&apos;m burning. My parents thought this to be a gift but I thought of it as a curse. Instead of me being ill when vampires where around, they became weak, dizzy, unable to defend themselves. I was to be a powerful weapon against them. When my parents decided to train me to become a vampire hunter at the age of 14, I refused. Why might you ask? Because I wanted to become friends with them, I did not want to be hated. I completely disagreed with my parents of such violence and thought that we could live in peace and harmony. My parents decided I needed to be spoiled so I would see it there way. They deliberately showed me news on how vampires had killed us humans though I always pointed out their reason of attacking. Their point of view. But I still did not sway from my decision. I had to stop this war and I knew it was my fate to do so. So why am I here again? To lure some vampire out into the open, which I don&apos;t want to do but I have to make a living some how just so my parents won&apos;t kick me out of the house, and this vampire has escaped from the vampire&apos;s insane asylum, which is probably right behind me thirsting for my blood because I can feel his cool breath on my neck. Joy.